broad. The small wind-pollinated flowers are produced in a branched arching to pendulous inflorescence 30–50 cm (12–20 in) long. The edible seed is a grain (caryopsis) 5–12 mm (0.20–0.47 in) long and 2–3 mm (0.079–0.12 in) thick. Rice cultivation is well-suited to countries and regions with low labor costs and high rainfall, as it is labor-intensive to cultivate and requires ample water. Rice can be grown practically anywhere, even on a steep hill or mountain. Although its parent species are native to Asia and certain parts of Africa, centuries of trade and exportation have made it commonplace in many cultures worldwide. The traditional method for cultivating rice is flooding the fields while, or after, setting the young seedlings. This simple method requires sound planning and servicing of the water damming and channeling, but reduces the growth of less robust weed and pest plants that have no submerged growth state, and deters vermin. While flooding is not mandatory for the cultivation of rice, all other methods of irrigation require higher effort in weed and pest control during growth periods and a different approach for fertilizing the soil. 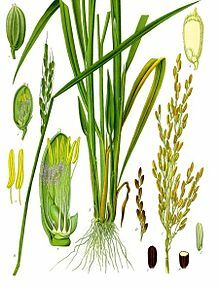 The name wild rice is usually used for species of the grass genus Zizania, both wild and domesticated, although the term may also be used for primitive or uncultivated varieties of Oryza.